This summer, while touring the East coast, I came across two examples of library art. 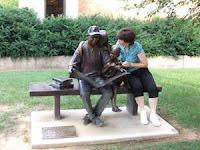 The first was a "reading" statute outside Waynesboro Public Library. 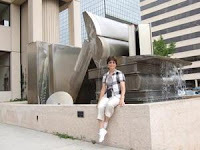 The second was a large book fountain outside the Chattanooga Public Library in Tennessee. Thanks to tools like Flickr, libraries can post photos of their artwork for all to see. I love the pictures on your blog, thank you for taking the time to teach me how to set up my FlowerGirl blog.